Weipa is a mining town. Bauxite lies just under the surface here, an important input to the production of aluminium. Rio Tinto has the mining license and is the major employer in the town. There is a tour of the mine advertised at the caravan park. It seems a good opportunity to see a working mine and find out how it operates. Off we go, in the tour bus. 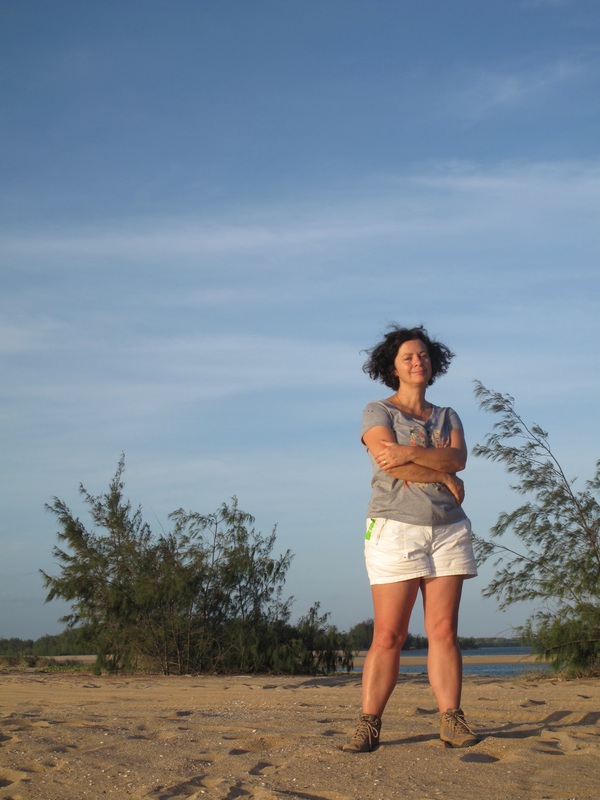 Rio Tinto employees have to live in Weipa to work at the mine. There are no fly in fly out workers, except for some contractors. The focus is on building a strong community of long term workers at the mine. The bus driver tells us about the facilities Weipa has at its disposal, many sponsored by Rio, including a well equipped hospital. Minor operations can be carried out, but there is no maternity ward. Mothers to be have to fly to Cairns, four weeks before the baby is due. The bus takes us across a long one way road and rail bridge to get to the mine. We are told bridge maintenance involves the most dangerous dive in the world. Divers have to work in an underwater cage because of the crocodiles, sharks and sea snakes in the water. At the mine we watch massive water trucks drive along the wide roads, wetting them down to reduce dust. Driving one of these mammoth vehicles is a sought after job in the mine. 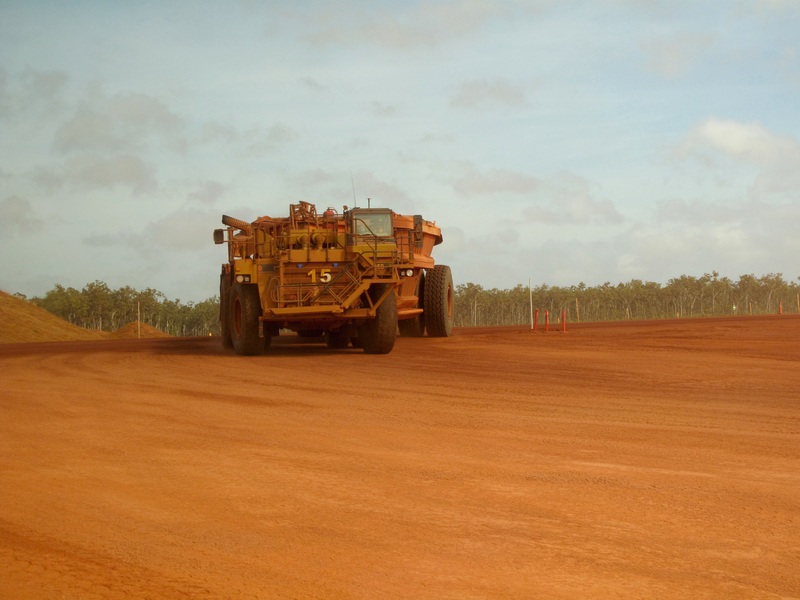 We see huge haulage trucks thundering along the red orange roads, carrying tonnes of the valuable bauxite rocks. Production operates all day and all night. The mine has to constantly fill ships that carry the bauxite to Gladstone, Tasmania and NZ. This is mining at its simplest. The vegetation and top soil are removed. Loaders dig out the bauxite layer and take it away. There is no processing required. Once the bauxite layer has been exhausted, the top soil is replaced and contoured to replicate the landscape before mining. Seeds that were saved from the original vegetation are sown to regenerate the area exactly as it was before. Any animals, including reptiles, are captured and housed while the mining is taking place. The indigenous group that owns the land also retrieves any sacred objects and notes any off limits areas before the dozers go in. The recovery work is world leading, they say, and is very effective. 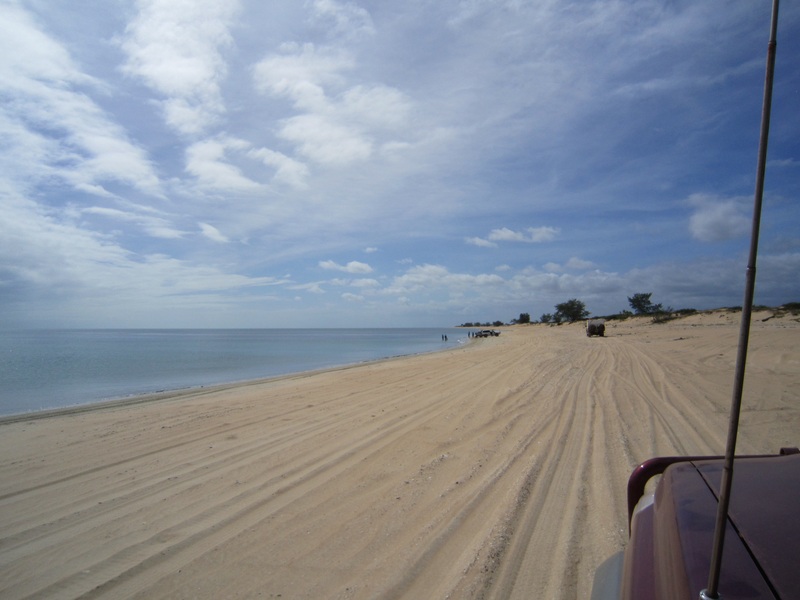 After the mine tour we head off to the mouth of Pennefather River for a beachside camp site. We cross the mining roads and watch and wait as the monster trucks rumble past. Down a narrow dusty track to the beach there’s a spot for lunch and time to prepare the vehicles for four wheel driving. Tyres are deflated and hubs are locked. The beach is golden sand and the sea calm, blue and inviting. No one is swimming here, there are crocodiles and sharks. Even Aussies, who shrug their shoulders at venomous snakes and spiders, generally avoid swimming with these two apex predators. Driving across the soft sand, our ute wags her tail in increasing arcs, trying to find grip in the loose sandy surface. We follow Beryl and Howard down to the water’s edge, looking for harder sand. As we start to climb back up the ridge to move away from the water, the tyres dig into the sand and we come to a standstill. Richard leaps out, lowers the tyre pressures a few more pounds and engages both diff locks. I stare at the water, just inches away. It is hot outside with the sun beating down, then reflected back by the crystalline sand. People call encouragement and ask questions on the radio. The ute is up and away and we drive on to find the camping spot at the mouth of the river. There’s an old ranger station just off the beach and a satellite dish provides the fastest wifi I’ve come across since we left Victoria. Safari tents have been set up on the riverside and water is pumped to a basic shower in a tin shack. A long brown snake is seen disappearing into a hole by the shower door. 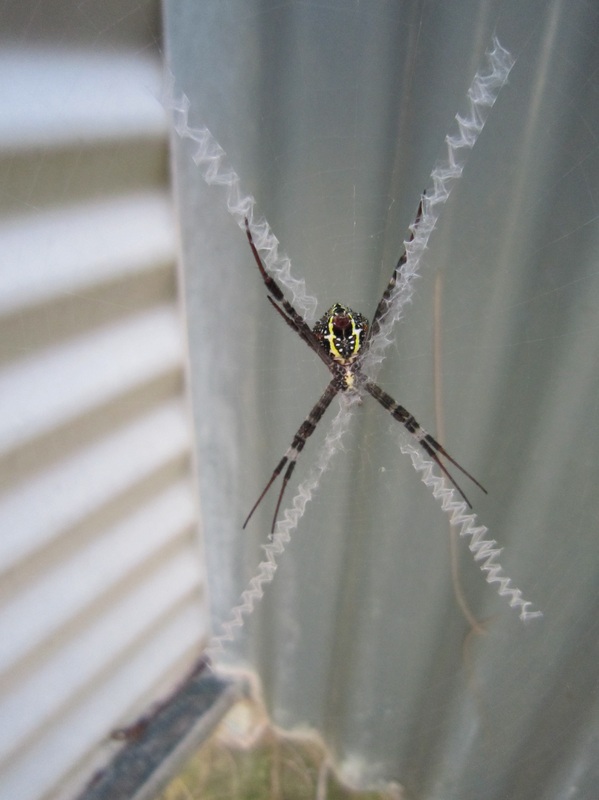 A yellow and black spider sits inside, in an unusual web, marked with a white X. There are a few campers here already, and not all of them are human. The view is idyllic. Sand, gentle lapping waves, swaying she oaks, blue sky. Picking up my binoculars to look at a sea eagle on the sand bar, I see a dark shape on the sand. It’s a croc. He’s small, about four feet long. As I watch he slides down into the water and lies in the warmth of the shallows. A little later his brother is spotted on the other bank of the river. I’m staying well away from the water tonight. Max heads off to the beach, fishing rod in hand. 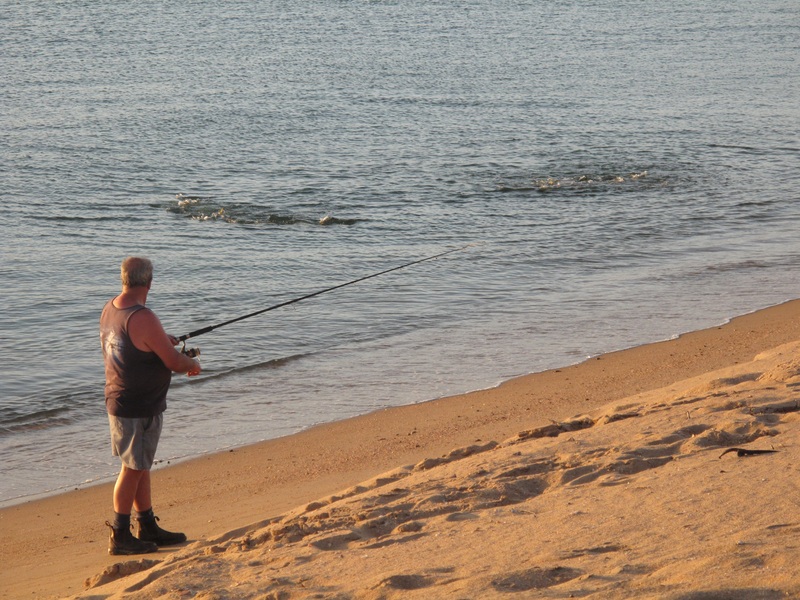 Standing where the sand meets the sea, casting out a lure into the shimmering water, with one eye watching the line set with bait, he’s at one with the world. The camp site is busy, with trucks and quad bikes driving past late into the evening. 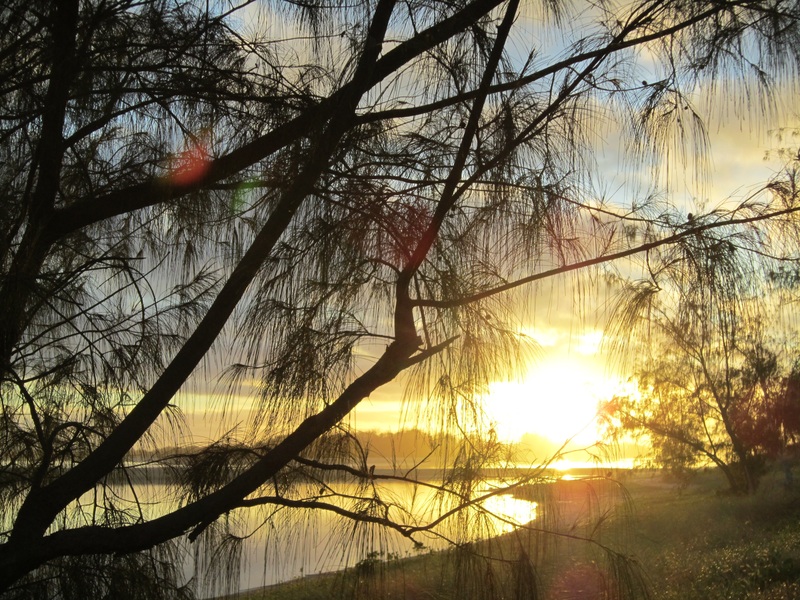 It’s a remote spot, but an easy weekend getaway for the workers of Weipa. The sand is lined with criss cross tracks from their vehicles. Every place has a story. The European story is now entangled with the story of those who have lived here for tens of thousands of years. Turn the page, let’s see what the next chapter brings. This entry was posted in Australia, queensland, travel and tagged Australia, Outback, pennefather, queensland, Travel, weipa on 19/06/2015 by Deb McSephney.